The next PDC will be in July, when Chris & Looby will be joined by Tomas Remiarz, author of Forest Gardening in Practice. 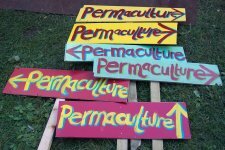 Two weeks of summer immersed in permaculture at Applewood doesn’t get much better! Or have a look at their Forest Gardening course in June. Hello Chris, we spoke on the phone today. Phil and I are considering turning half of our garden into a forest garden and maybe a wildflower area and we’d like to be a bit more informed before we embark on a course.